Welcome to another edition of Homeschooling: Kindergarten Edition! I briefly covered the methods that we're loosely following in my last post. If you want to get caught up, please read that first. Today, I wanted to tell you about what we do first in the morning. After our Morning Routine, we all sit down to breakfast. Ideally, I have already eaten breakfast with my husband and cleaned up. So it's usually just the kids who are eating. I begin by quoting the week's memory verse 3-5 times. I've struggled with whether or not we do this memory work. Both James and Evelyn have Sunday School verses and we have a family verse that we memorize as well. This week, however, we are doing the "school" memory verse. After reviewing the "school" memory verse, I follow with our Scripture reading that corresponds to the Bible lesson for the day. 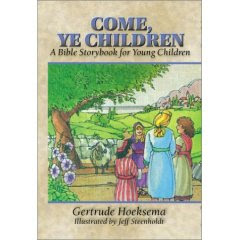 We are using Covenant Home's Bible curriculum for Kindergarten. I don't believe that I'll ever agree with any book 100%, but I do like the fact that this Bible module is from a reformed perspective. Oftentimes the Scripture reading is very long -- sometimes more than 3 chapters! I would like to cut this down and make it shorter, and I know of several moms who do/did. The problem is my 5 year old! When I say, "Wow! This is a long reading today. Maybe I should shorten it", he BEGS me to read the entire thing including genealogies! He loves the Scripture, and there is nothing that thrills me more. So, I've just come to the conclusion that I will read the entire passage of Scripture no matter how long it takes. Another specific quirk of my son is that he LOVES to discuss ideas and philosophies. This is a potential problem for me as I struggle to keep on schedule for the day. But, one of the main reasons that we homeschool is to pass on our worldview to our children. If they wish to discuss issues, we desire to teach and instruct in the ways of the Lord. James will discuss anything all day long! He loves to ask questions, find out the whys of our beliefs and tell us what he thinks. So, often our Bible lesson generates many questions. After the Scripture reading, I read from the Bible storybook. As I mentioned before, it's from a reformed perspective, so I appreciate the emphasis on the covenants of God and God's sovereignty. James enjoys this reading and Evelyn is beginning to pay attention more closely. Next, I review both children's Sunday School verses with them. I usually quote them 3-5 times and by the third day, they're both usually saying them with me. Then we do catechisms. I am doing the child's catechism with Evelyn which has shorter questions and answers. It's divided into 2 sections -- history and doctrine. I'm hoping to get through all of it by the time she's 5 years old, but I never accomplished that with James. My philosophy is that something's better than nothing! We've started working on the Westminster Shorter Catechism with James. He's currently on question 10. The reason that we've started with the Shorter Catechism already is two-fold. 1) He's ready. He loves to memorize and is quite good at it. He also seems to comprehend most of it. For me, comprehension is not a prerequisite to memorization though. Following the classical model, I like to encourage memorization and then go back when he's able to understand (in the logic stage) to explain. We will most likely review the Shorter Catechism until Junior High, at least. 2) It was intended for children. The Larger Catechism was written for adults, but the Shorter Catechism was written for young children. In today's "dumbed-down" society, I want to encourage my children to think the thoughts of God and to stretch their vocabulary and reasoning ability beyond what is "expected" at their age level. When I first introduce a question, I'll read the question and answer 5 times. Then we're done. The next day, I'll do the same. He's welcome to join in at any time. Once he starts saying, "I know it, Mom", I'll let him try it on his own until he gets it right, gently correcting his mistakes. He usually learns a question in 1 week, but some questions have taken 2 weeks. James seems to enjoy this as well as I do. After catechisms, we usually sing a song to work on memorizing the books of the Bible, then we sing a few verses of the hymn we're learning for the month. Closing out our session is prayer. I've made a prayer book for each of the children with each page naming a different person, and I've included a picture if there is one available. (I need to get some more printed from Snapfish!) We pray for a different person/couple/situation each day, and they each pray for one aspect regarding that person/couple/situation. I've probably bored you to death, but that is what we do for Bible each day! Wow, that sounds very thorough. What a blessing that your son is so interested in spiritual things! How long do you spend on this section of your day? Our goal is 30 minutes each day. Some days I may leave something out though if we're short on time. Since we review the verses and catechisms each day, leaving out one or two days doesn't seem to make a difference with the kids. They still learn them. We may also leave off the singing for a day or two as well. We accomplish the Scripture reading, Bible story and prayer every day though.